It's easy to understand the importance behind having every single word recorded during a deposition, as the word "not" or the misspelling of a word can change the entire meaning of a transcription, and consequently alter the outcome of a case. But something that does not seem as obvious, but is in fact just as important, is having the correct punctuation, as an instructor at the Prince Stenograph School recently said. Brianne Demma explained in a blog post in February that knowing proper punctuation and grammar rules is vital to having the correct meaning of a sentence. "Court reporters need to be vigilant not to misconstrue the meaning behind the words they are transcribing," she wrote. "I am reminded of one of my favorite punctuation jokes. This joke displays a picture of an elderly woman surrounded by the sentences 'Let's eat Grandma' and 'Let's eat, Grandma.'" 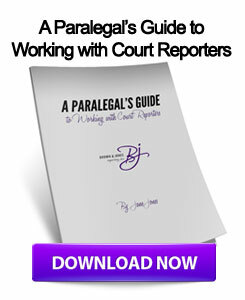 When editing their transcripts, she also explains, court reporters must know the "foundations of the English language," to be able to convey the exact meaning of what was said in the court room, one of the reasons certified court reporters take English classes in addition to learning transcription rules. With any uncertainties of grammar or punctuation rules, the integrity of the transcript may be compromised, hurting both the court reporter and those involved with the case. This, along with many other reasons, is why having the proper English training and education is vital to any court reporter. For lawyers in Wisconsin, partnering with a certified court reporter can ensure that all depositions are accurately transcribed. This entry was posted on Monday, June 10th, 2013 at 4:08 am	and is filed under All Posts, Court Reporting Services. You can follow any responses to this entry through the RSS 2.0 feed. You can skip to the end and leave a response. Pinging is currently not allowed.